Last night I was fortunate enough to experience a great live performance by David Bridie and band, promoting his new album Wake. I first became aware of David’s intoxicating, emotional bass voice and brooding songs during his My Friend the Chocolate Cake days late 90s, and later bought a solo album of his by chance, which I also enjoyed. When I saw recently that he was going to be performing not so far from where I live, I thought it would be crazy not to catch him in the act! 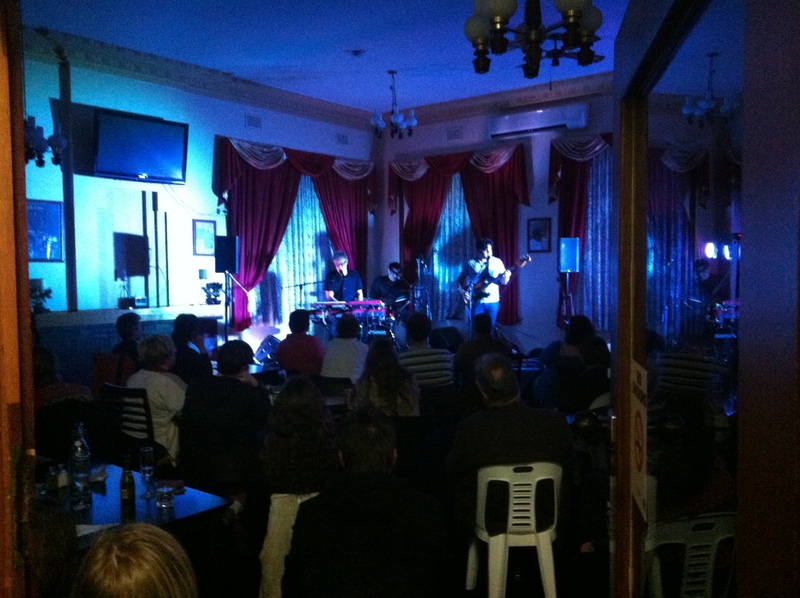 Ararat Live brings “original musicians to the Ararat district for intimate gigs in small venues”. The brainchild and hard work of a small and dedicated band led by David Nicholson, and partly an outcome of the annual Lake Bolac Eel Festival, it’s a great offering to the local community and deserves to be applauded loudly (as it was last night!). I’ll certainly be making a point of supporting this when I can in future. One of the best things about the night – hooray for being in the country on this occasion! – was the intimate scale of the gig. 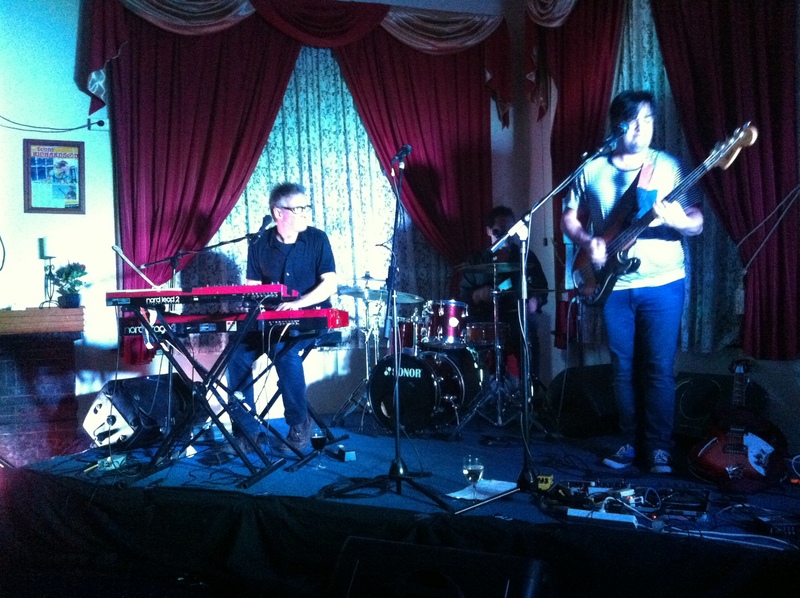 The venue was the red room at the back of Ararat Hotel – which I gather is the dining room, and not a big one either! No one was more than a few metres from the stage, and there was no bar in the room to distract. And even better was the respect shown by the audience – which actually listened to every note! It’s so rare in my experience, and such a joy to be a part of. In my home town I got sick of being at gigs where the artist would be constantly competing with the audience to be heard. No such issues last night. And the music? It didn’t disappoint – every bit as thoughtful, carefully crafted, emotional and often brooding as I remember David’s work being. It was especially joyful to watch the deft way he directed the input of the drummer – Greg Patten, ex MFtCC and whom I gather hasn’t been doing the majority of the tour with David and Kiwi guitarist/bassist Eden Mulholland – plus how instinctive Greg was in reacting to David’s direction and finding just the right level and sound at key points in each song. Phenomenal – it was really a cut above, an awesome demonstration of what it means to be a professional muso (and no doubt to the inherent understanding two artists can develop having worked together for a long period of time). One of the things I particularly noticed – and to be honest I hadn’t really twigged before that David was a pianist – was both the importance of having a good set up and relationship between height of keyboard and seat (result? unplanned trip to Ballarat today to buy a proper keyboard stool – no more dodgy, too low, dining chair practising for me! ), and yet how that didn’t stop David from getting so engrossed in his performance that he made himself look decidedly uncomfortable at times, on what I know from experience is quite a comfortable seat! He wriggled about and flung his legs out at awkward angles, and I was sure he would knock over the glass of wine placed at the front of the stage for him. I want to learn to be so abandoned and unselfconscious in my own performance. 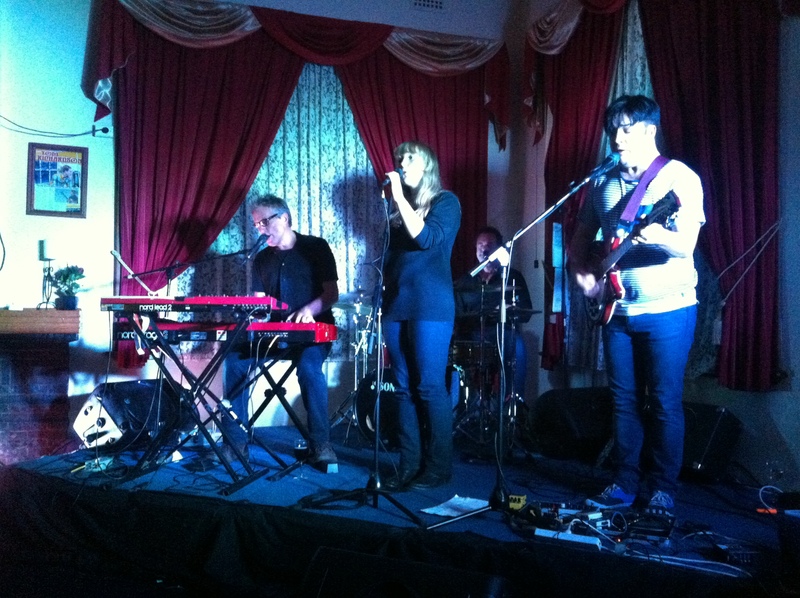 So thank you Ararat Live for promoting fab intimate live gigs in my local area, and thank you David Bridie, gorgeous daughter Stella on backing vocals, and Eden and Greg rounding out the quartet last night – I’m reinspired! This entry was posted in Uncategorized and tagged Ararat Live, David Bridie, Eden Mulholland, My Friend the Chocolate Cake. Bookmark the permalink.